A lightweight wallet comfortable in a front pocket, slightly larger than the size of your credit card. Blocks RFID skimming. 6 credit card slots with 2 extra interior slots. Silver ballistic nylon accents. Dimensions: 4.12" x 2.87" x 0.18"
I had to get used to it being smaller than my previous wallet, but I now love it! Forks, knives, spoons, nuts, bolts, appliances, skyscrapers, bridges, cars and trucks—the list of everyday items made of stainless steel goes on and on. But a wallet of steel, now that’s unique. Made from re-purposed industrial-grade stainless steel fabric by a family-owned New York-based company called Stewart Stand, these wallets are full of strength and character. Radio-Frequency Identification (RFID) hackers who use scanners to skim information from credit and debit cards right through ordinary wallets don’t stand a chance with a wallet of steel blocking their signal. In addition to protecting your personal information, these wallets are sleek and contemporary, as well as surprisingly lightweight and flexible. Choose from three styles that vary in size and function. While its woven material gives The Bill Fold Crossing a look all its own, its traditional form holds up to 8 credit cards and features plenty of room for cash. With a slightly slimmer profile, The Credit Card Wallet contains 3 credit card slots and an ID window for easy, convenient access to your license at any time. Then, there’s the most minimalist of them all—The Driving Wallet—only slightly larger than the size of a credit card and small enough to fit in even a front pocket. Just like leather, the stainless steel material ages and patinas over time, but that’s where the similarity ends. 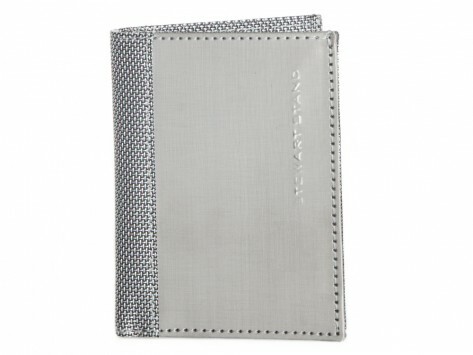 For men of style, a wallet of steel is sure to make a strong statement.